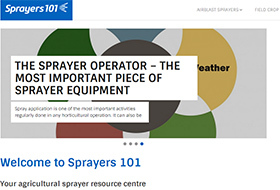 Sprayers101.com is an agricultural sprayer resource centre. Sprayers 101 describes best practices in the safe, efficient and effective operation of agricultural sprayers. This library of articles, fact sheets, videos, lectures and apps has been organized to help you find what you’re looking for: Search by topic or explore the menus under “Airblast” or “Field Sprayer”. Thanks to everyone that edited, contributed to , inspired or simply supported the research and development of the content for this website. New information is posted all the time, so check back often.